BUFFALO, N.Y. (AP) — The Buffalo Bills will have a better idea within the next nine months if they will continue playing at their suburban stadium or if a new one will be built downtown. That’s the timeframe given to two firms hired by the parent company that owns the Bills and the NHL’s Buffalo Sabres to study the future needs of both teams’ facilities, including determining whether to build a new football stadium to replace 45-year-old New Era Field. Popko stressed there are no preconceived notions favoring renovations versus a new facility in launching the feasibility study that will include input from state and local governments and fans. He said it’s premature to estimate the costs and how much taxpayer assistance might be required. “Until we have more specifics about what the stadium may look like, what may be related to it, it’s too early to tell you what the pitch may be,” he said. As for the Sabres’ home, the study will identify what structural upgrades and other modernizations are needed. The facility has undergone only minor renovations since it opened in 1996. The study comes as the Bills have five years remaining on their lease with the state and county, while the Sabres have eight years remaining on their lease with the county. The future of the Bills’ home, currently located in suburban Orchard Park, has been a major topic of discussion since Terry and Kim Pegula purchased the franchise in 2014 following the death of Hall of Fame owner Ralph Wilson. 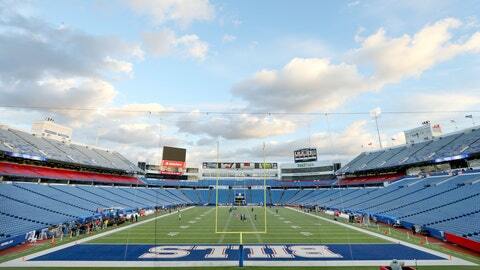 The sale came two years after the Bills agreed to a 10-year lease. The deal committed nearly $227 million of taxpayer money toward extensive renovations and annual capital and game-day expenses. During the sale process, a state-funded study identified three sites in downtown Buffalo as possible locations for a new football stadium, while also examining the cost of the team remaining at its current site. Both options carried hefty price tags: A new stadium would cost at least $1 billion, while the next round of renovations would cost $540 million, in part because of major renovations to the stadium’s third deck, according to the study. Popko told The Associated Press the new study would start from scratch, while using the 2014 study as a reference point. However, there are limitations to how blank the slate might be. Any major renovations at New Era Field would be expected to include mandatory upgrades that fall under the Americans With Disabilities Act. As for new stadium sites, there’s a limited amount of open spaces downtown large enough to accommodate such a development. One of the three sites identified in 2014 has since been developed. The site that drew the most attention is a large two-block parcel of street-level parking lots located in the city’s emerging Cobblestone entertainment district. The site is located a block east of the Sabres’ arena and within two blocks of HarborCenter, a $200 million hotel and hockey entertainment facility built by the Pegulas, and a newly opened brew house operated by the Pegulas. One person directly involved in discussions four years ago told the AP in January the Pegulas were focused on building a downtown stadium, and that the Cobblestone site was regarded as “one of the prime target areas.” The person spoke on the condition of anonymity because the talks were private. Without revealing the locations, Popko said the Pegulas own “a decent amount of land” downtown.